Revive Active Antarctic Krill Oil is an extremely bioavailable source of essential omega-3 fatty acids, EPA and DHA. 100% purity and 100% traceability from sea to shelf. Revive Active Krill Oil is a source of the phospholipids EPA & DHA omega-3 essential fatty acuds and also contains astaxanthin and choline. EPA and DHA contribute to normal heart function, while DHA also contributes to the maintenance of normal brain function and vision. Choline contributes to normal homocysteine metabolis, normal lipid metabolism and the maintenance of normal liver function. The omega-3 fatty acids EPA and DHA that are found in traditional fish oil tend to repel water, which impairs absorption in the digestive tract. Whereas the structure of the omega-3s in krill oil promotes faster and more efficient absorption. Better your for you and better for your continued health. And as a bonus, there`s no fishy aftertaste! But along with ensuring that the Superba Boost Krill Oil capsules contained a high concentration of this krill oil, Revive Active also wanted to be sure that the krill they use are harvested in an environmentally responsible way. With that in mind, Revive Active have partnered with AkerBioMarine, the only krill fishery to receive Marine Stewardship Council certification for adherence to responsible and sustainable management of krill in the Antarctic ecosystem. Krill are tiny shrimp like crustaceans that are found in the pristine waters of the Antarctic. The actual krill harvest varies from year to year with a typical season yielding approximately 150,000 tons which is a marginal percentage (Approx. 0.02%) of the total krill biomass. Superba Boost Krill Oil 590mg (from E. Superba) (Crustacean), softgel capsules (gelatine, glycerin, sorbitol, ethyl vanillin, purified water). Store in a cool, dry place out of direct sunlight and keep out of reach of children. 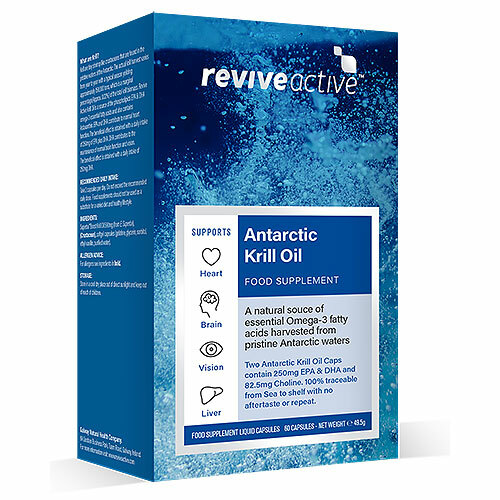 Below are reviews of Revive Active Antarctic Krill Oil - 60 Capsules by bodykind customers. If you have tried this product we'd love to hear what you think so please leave a review. Very good. Hard to find a good omega 3 this one is very good will be buying again.